All the teachers involved in the Stay @ School project have the opportunity, after having attended the online training course, to participate in the online discussion on the project forum. A specific discussion is opened for each of the five modules hosted on the portal. 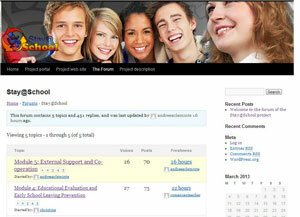 Over 500 contributions have been made on the project forum.